The Spring Wave Release of Microsoft Dynamics New CRM 2016 Online includes more service functionality, more intelligence and amazing web portals! Update : 24th May 2016 : Its arrived! Check out the announcement here. Yesterday Jujhar Singh at Microsoft released the update of the new CRM 2016 spring wave details, which will be rolled out to customers during May – July 2016 (Microsoft’s Q2). FieldOne was acquired by Microsoft in July 2015. This is field service management which is critical for service management, helping people to be better engaged. It provides scheduling and work automation together with the ability to manage multiple projects keeping plates spinning over consecutive projects. AdxStudio has a great offering of web portal features which are comprehensive. Web self-service in 2016 is so important that this extra functionality will allow customers to extend sales and service processes empowering and aiding better communication with customers. This generates value and streamlines processes. So what will the new CRM 2016 Spring Wave include? This new CRM 2016 Spring Wave, Microsoft has also provided extensions to the service capability with “project service”. This will really help Dynamics CRM 2016 users’ drive service and delight customers every time. This, together with Microsoft CRM’s present capability will only seek to continue to transform customer service capabilities. This true focus on service is really pushing new CRM 2016 to a consolidated service model binding selling products and service really making a comprehensive customer experience. Microsoft is calling this “everything-as-a-service” and this will be incredibly important for precautionary maintenance including upgrades and billing. Microsoft is using a “service delivery foundation” to create cohesion of project service and field service together, which creates a USP for Microsoft Dynamics CRM against its competitors. The new CRM 2016 spring wave will truly help project and staff out in the communities to stay connected. The ability for scheduling and service is impressive and far superior with these new additions. The new web portals in CRM 2016 Spring Wave integrating AdxStudio will help to engage circles, allowing information share and communication of customers, employees and wider networks. Added to the process functionality, the spring wave of CRM will also build on its guided processes, providing dialogue navigation and tasks, which are role based to help user engagement and relevancy. Microsoft Social Engagement available on the CRM Online platform also has been improved using adaptive learning which helps to score sentiment and also understanding comments. For example, slang and other terminology used on social media that may seem like negative words may actually not be, and the CRM user will be able to make these positive words in the software. Not only that but CRM Online 2016 spring release will also remember those words so they are flagged correctly for future use. This will keep reporting on track and help generate efficiencies for users to put their social efforts in the right place. 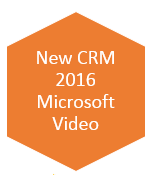 Check out this video that Microsoft has produced of its Dynamics New CRM 2016 spring release that is due out later in 2016. Click the image below to see the video! 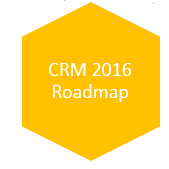 And to empower its partners and CRM Online users further it has also released a useful Dynamics CRM Roadmap. Click the image below to check out the Dynamics CRM 2016 Spring Wave Roadmap. Dynamics, new CRM Online 2016 just keeps getting better and better, as Microsoft continues to invest, acquire and build on the functionality is already has. This sets Microsoft to continue its success with Dynamics CRM as organisations become increasingly savvy to automation, driving customer service, marketing and sales. Check out Jujhar Singh’s blog here, all about Dynamics New CRM Online 2016 Spring Wave Release. This details: the new updates as well as updates for Social Engagement and Dynamics Marketing. Want to find out more? Here is some more information about the new freatures from Microsoft.